The Solidarity Center’s program in South Africa aims to improve the lives of working people, particularly the most vulnerable—farm workers, domestic workers, migrant workers and women workers—who face long-standing barriers to sharing the country’s economic prosperity. Together with union and human rights allies, the Solidarity Center addresses the interrelated issues of collective bargaining, economic policy, gender equality and resource-building. As South Africa continues to transition to democracy, persistent colonial and apartheid era structures fuel inequality and poverty, threatening its democratic stability and economic growth. Income inequality in South Africa is among the worst in the world. Gender inequality remains a major barrier to human development. Although the South Africa Constitution provides some of the most far-reaching guarantees for gender equality in the world, South Africa ranks 116th globally when gender inequality is measured by income, education and life expectancy, and gender-based violence is prevalent. With roots in colonial-era struggles over land, labor, and minerals, structural inequality persists. Major strikes in agriculture and mining have exposed unresolved issues that confront democratic South Africa. The Solidarity Center’s strongest ally in South Africa is the 2-million member Congress of South African Trade Unions (COSATU). The Solidarity Center also works closely with the Federation of South Africa Trade Unions (FEDUSA). As the strongest voice in civil society, the South African labor movement enables workers to join together for better wages, pro-worker economic policies and increased standards of living. Seeking to empower women and maximize their earning potential, the Solidarity Center works with COSATU, FEDUSA and other worker organizations to promote the Labor Rights for Women campaign, an effort that helps create provincial-level dialogue around such issues as maternity protection, sexual harassment and gender and sexual orientation discrimination at the workplace. To help build stronger legal and social representation for the estimated 1.1 million domestic workers in South Africa, the Solidarity Center works with the South African Domestic Service and Allied Workers Union (SADSAWU). The Solidarity Center helps SADSAWU improve its organizing outreach and holds exchanges between SADSAWU and U.S. domestic workers’ organizations, and also supported SADSAWU’s first-ever national conference, which set out organizing and advocacy goals. 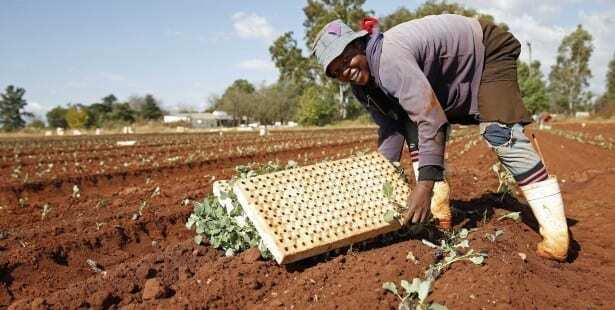 South African farm workers struggle in jobs characterized by long hours, low pay and little room for workers to assert their workplace rights. These workers, many of whom are migrants, also face legal struggles and social exclusions that compound their economic marginalization. Working with the Food and Allied Workers Union (FAWU), the Solidarity Center bolsters the union’s efforts to represent and assist migrant farm workers in Mpumalanga Province and ensure farmworkers in Mpumalanga and KwaZulu-Natal join in labor-management dialogue and wage negotiations that amplify their voice.